Disney CEO Bob Iger controls ESPN, is chairman of Los Angeles NFL stadium group. 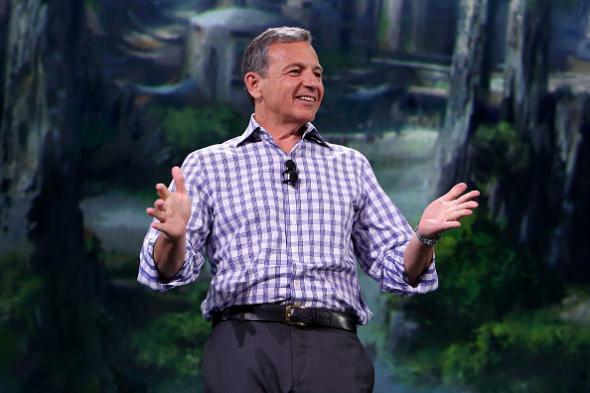 Disney CEO Bob Iger at Disney’s D23 EXPO 2015 in Anaheim, California, on Aug. 15, 2015. The San Diego Chargers and Oakland Raiders have reached an agreement for Bob Iger, the highly-regarded Disney chairman and CEO, to become chairman of their bid to build a stadium in Carson, Calif. according to sources with knowledge of the situation. It’s a potentially game-changing move that could propel those teams to the Los Angeles market by next season … Igor [sic] is expected to drive the overall vision for the stadium project for the Chargers and Raiders, with the opportunity to become a minority owner himself at a later date once he has retired from Disney. In other words, ESPN has already had high-profile trouble separating its journalistic coverage of the NFL from its need to please a major business partner—and now the CEO that controls ESPN has set up a side gig building an NFL stadium with the option of becoming an NFL owner at a later date. On another note, this would seem to help the Raiders/Chargers group’s chances of getting the NFL’s approval for its Los Angeles stadium vis-à-vis competing Los Angeles stadium projects. (There are currently no NFL teams in L.A. but the Raiders, Chargers, and St. Louis Rams all want to move there.) If you’re NFL Commissioner Roger Goodell, why wouldn’t you take the opportunity to get closer to the guy who controls ESPN? He might be able to do you a favor some day.